People still can't spell my name right, guys! It's funny how I ended up in Waco for four days, especially because I never really expected to be shooting any sports any time soon. This past Monday, I got into work pretty early, like 5:30 am early, and my coworker who sits behind me asked if I had any photography gigs this weekend. There weren't any Instameets going on and I didn't have any portrait sessions so it was an unusual, "no." Literally an hour later, I get a text from my former internship supervisor asking if I had any plans this weekend. I told her no and that I was just going to chill and probably hang with some friends. Which then sprung up her next question... "How far do you live from Waco?" My response was roughly two hours depending on traffic because anyone who lives in Texas knows that if you take I35, be prepared to plan your day accordingly. 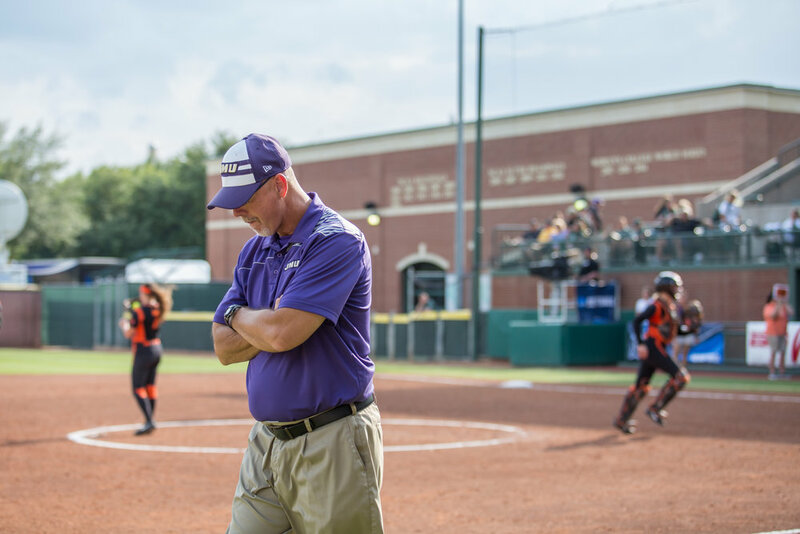 She then asked if I was interested in shooting the NCAA Division I Softball Regionals at Baylor University. Being that I was upset that I would miss another Regional with JMU, and after finding out that they weren't hosting this year, I sprung up and said, "when, where, and how long do I need to be there?!" She told me the weekend game plan and I told her that I was in after talking with my manager and getting approval to go. Before you know it, I was heading down to Waco with a car full of camera gear, bumping my Spanish worship playlist on Spotify and catching minor cases of road rage. Once I got there, I was feeling pretty nostalgic to be traveling with a JMU sports team again and seeing all of the familiar and friendly faces from Harrisonburg, Va. I also got to meet the extremely talented Director of Video, Clayton. It was awesome to watch him work and create the videos that he does for the athletics department. I also got to see my friend, Curt Dudley, the voice of JMU athletics and I met Ty, one of the team administrators. We had some great conversations and got to know each other in the little bit of time that we had in Waco. So, I'm just going to share some of my photos from the games, which is the whole reason behind this post. Also, check out this photo that my friend, Scott took of me on ESPN! The ambitious Dukes take the field at Getterman Stadium to get some practice in. The weather from Dallas to Waco is very different. The humidity in Waco was enough to take your breath away and before I knew it, I was sweating profusely and feeling dehydrated. Other than that, it was nice to get back on the field to get some shots after not shooting any real sports since January when JMU's football team won the national championship in Frisco. Ok, so nobody ask me how I was able to get Coach Dean to give me a thumbs up but I sat there for a good five minutes waiting for him to do something. As a result, this is what he did. Can't complain because the shot was totally worth it and if you know Coach Dean, I'm sure it is meme worthy because someone like him has to have a ton of funny phrases that would be perfect for memes. The Dukes had a great first game against OSU and it was tough at first to get my eyes back into seeing action again. Everything was moving way faster than what I had practiced for earlier last week (See my Neighborhood Basketball post). The Dukes went into this game ready to go and I was confident that we were going to get this dub and go home for the night. We were up 2-1 going into the sixth inning, but Baylor had a heckuva hit and ended up with a three-run home run. That homer gave Baylor a 4-2 lead over JMU. Upset? Yes, but the ladies responded in the next game against Kent State. The rest of the tournament was on the line going into that game and in order to move on, we would have to beat Kent State. This was it. The moment we were all waiting for. If we won this game, we would move on and play Baylor again on Sunday. This one wasn't a nail biter thankfully. The ladies marched right by Kent State to go home for the night with a 4-0 win. The media guys didn't leave the field until a little after 10 pm so we were pretty tired. We went back to the hotel room, I plugged up my camera batteries to charge, took a shower, and knocked out before I could count 3 sheep. It was a long day, especially in that Waco humidity having your energy and every ounce of water drained from your body. So, here we are. The game that would decide if we go home or play Baylor for a third time to take him the Regional Championship two years in a row and advance to Super Regionals. The day started off pretty chilly and I think that I was more nervous than the ladies were. I was pacing and walking all over the stadium because I just wanted the game to start so we could get to this second game and decide the winner of the regional. After the game started, things were going as they should. Both teams were giving it their all and only time would tell when the winner would be decided. 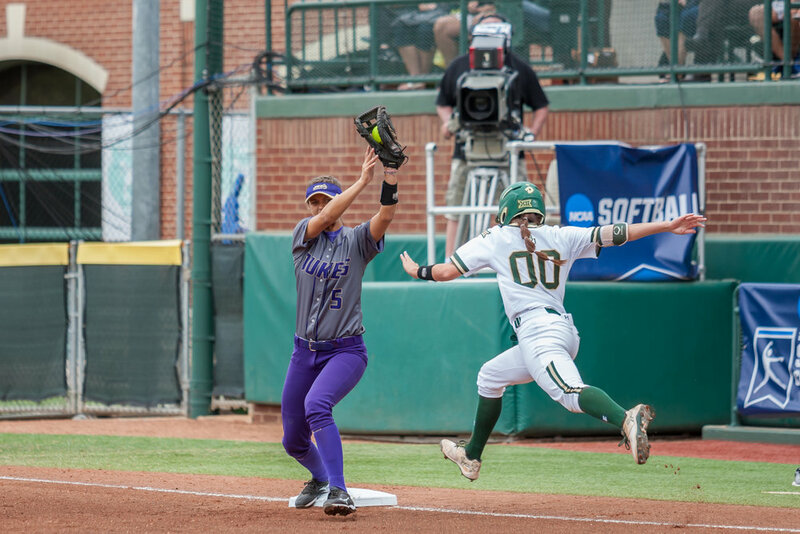 While trying to intentionally walk the batter who hit the three-run homer on Saturday, JMU's pitcher threw a pitch that went left and Baylor's runner on third bass took the opportunity to slide into home plate and score a run. Outside of that one point that was scored, neither team was able to get points from hits. 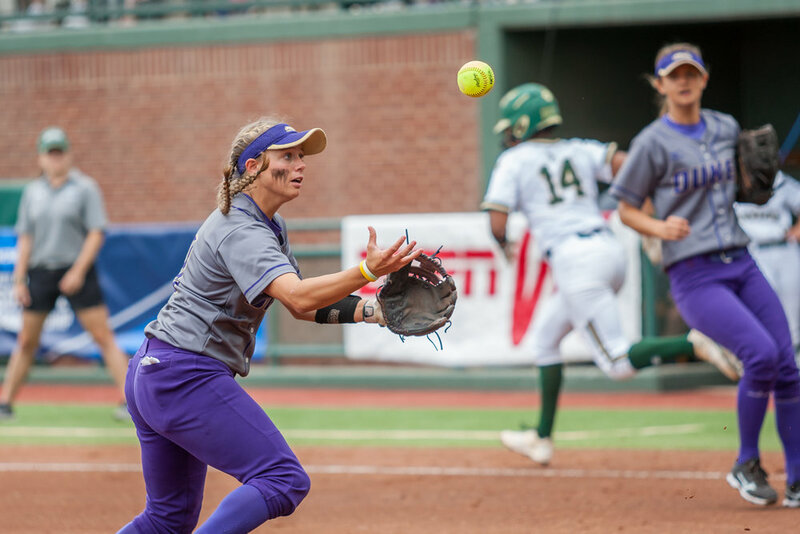 There were a lot of great plays being made in the outfield by both teams. 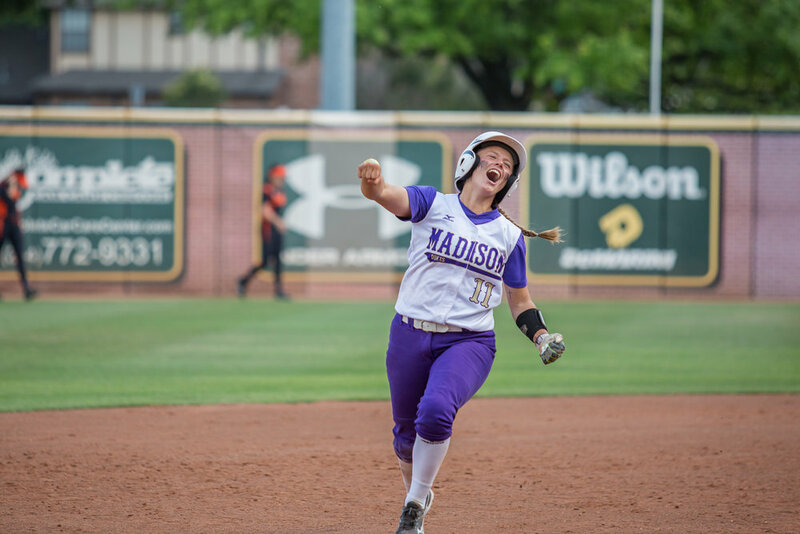 But just when we thought there was light at the end of the tunnel, a senior batter from JMU smacked a ball to center field! I mean, it looked sooooo nice. I thought to myself that this was going to be it, the home run that could get us out of the hole. 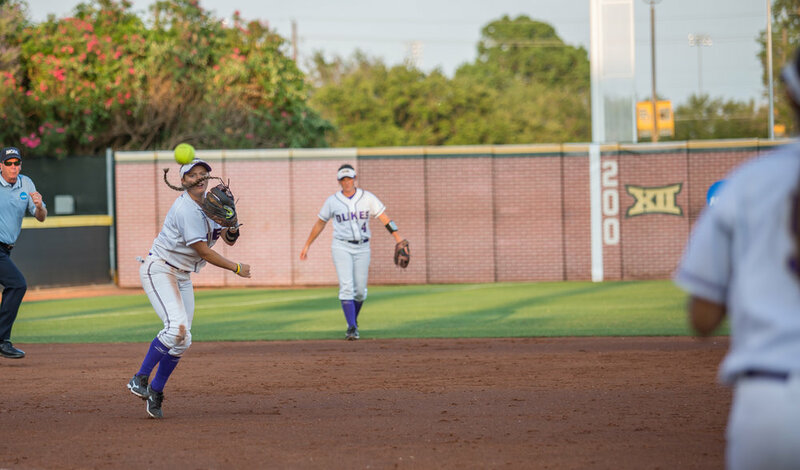 The ball fell just a few feet short of going over the back wall and was caught by Baylor's center fielder who wasn't letting a single ball touch the green the entire game. Defeated? For now, yes. But there's no doubt in my mind that these ladies will be just as great next year. I see them being twice as successful as they have been the past few years. 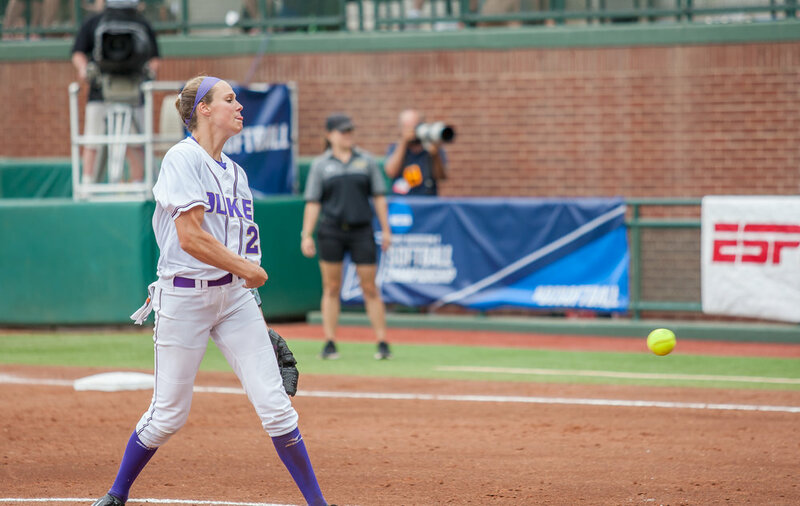 I'm ready to see this team make it to the Women's College World Series! It's only a matter of time now, ladies. Let's do this! 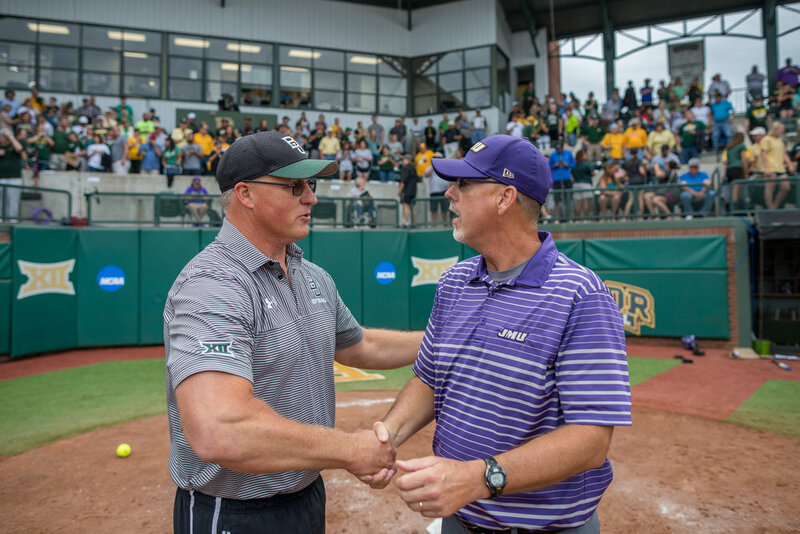 I want to send a super huge shoutout to JMU athletics for allowing me to photograph this tournament. It is always an honor to be apart of this amazing program, surrounded by amazing players, coaches, and staff. You all made the experience a million times better and I am truly grateful for all that you have done for me. Can't wait to see you all again! Click here to vist JMU's web site! 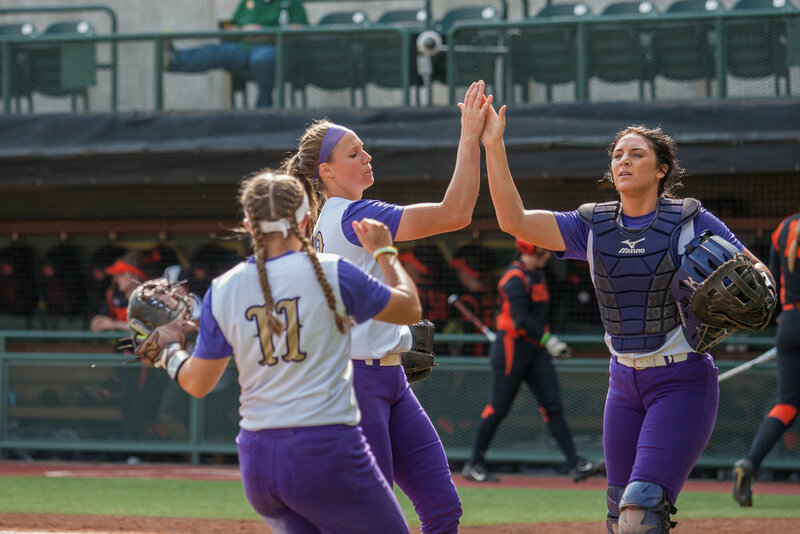 To see more content from this weekend and to follow JMU athletics, visit their web site. Click the link under the photo.